Fluoridation Queensland | TGA / CODEX / HEALTHY FOOD FOR AUSTRALIA? 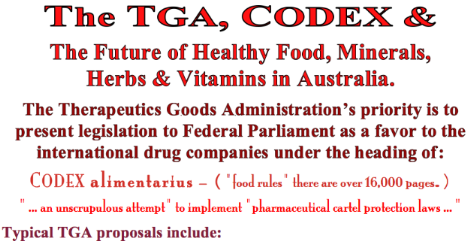 TGA / CODEX / HEALTHY FOOD FOR AUSTRALIA? You are here: Home / TGA / CODEX / HEALTHY FOOD FOR AUSTRALIA? Codex is to set permissible upper levels for pesticide residues, toxic chemicals, hormones in food and other environmental contaminants that may be many times greater than those advocated by chemical and pesticide industry lobby groups. Codex mandates that animal feed can be treated with antibiotics, hormones and growth stimulants. Codex Further mandates that the irradiation of food go ahead, despite the arguments of food safety experts. e.g continuing support for water fluoridation. Do your web searches; complain to your Federal politician in writing, write to the newspapers; get on the radio; and most of all, tell ALL of your friends, and then remind them again and again! The TGA has done little protect the Australian public in the past. It is working to restrict the $4 billion Australian supplements industry that is rapidly gaining markets over Big Pharmas control of the medical industry. The Australian public would loose access to health maintaining supplements which; would also disadvantage sports people, body builders (and pets). These products and services are consumer funded. under financed government health system. Most medical doctors have little knowledge of traditional medicines and nutrition. Many of these plants and minerals have supplied health to millions people around the world for centuries. Many herbs and spices used in cooking have preventive and curative properties and could be deemed to fall under these TGA restrictions. – Some of these culinary spices have been subjects of historic spice wars, and are part of a rich cultural tradition especially in Australian Indian communities who are unlikely to surrender to any regulations that the TGA might try to enforce. Some of these new proposals will force the Australian population to grow, harvest, import and produce these health-promoting products illegally and or go underground. The government does not have the resources to fully enforce these proposals; which would extend the dole queues, disadvantage the health of Australians, reduce revenue to the Australian Tax Office and restrict the choices of you the reader. Consumers will by-pass much of this attempt at bureaucratic control designed to support Big Pharma. “If you cannot enforce a law, you do not have a law”.